Samsung has unveiled its next Generation Galaxy Note on Mobile World Congress, equipped with 1.6GHz Quad core processor, Enhanced S Pen etc.. powered by Android Jelly Bean. 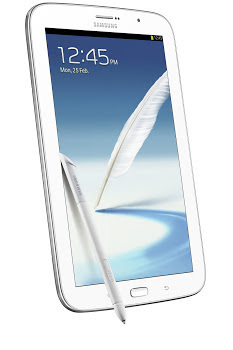 Galaxy Note 8.0 comes out after the success of Galaxy Note II and has enhanced S Pen operation. Lets look at the full spec and whats enhanced S Pen operations. Enhanced S Pen operation is nothing but we can now use the S Pen for Menu selections and back buttons on the Android. If you have used earlier versions of Galaxy Note Phones, then you would love this new simple addition. Other features of S Pen are Air View, Popup Note, Popup Video, Shape Match, Formula Match, Idea Sketch. Price and availability is not yet known completely, stay tuned with Technology Cloud, we will update once we have confirmed data on the dates. Checkout the more news about Mobile World Congress and Product announcements.